Researchers at Caltech, Oak Ridge National Laboratory, the Air Force Research Laboratory, and Carnegie observed for the first time how vibrations of atoms in a crystal lattice (phonons) can stabilize an ordered phase more than a disordered phase. This is the reverse of what has been exclusively observed until now; usually the stronger chemical bonds of an ordered phase cause its atoms to vibrate less at a given temperature, giving it the lower vibrational entropy. 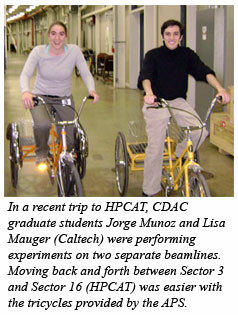 The work was carried out by CDAC graduate student Jorge Munoz (Caltech), and the published paper also includes as co-authors CDAC graduate student Lisa Mauger and former CDAC students Matt Lucas and Mike Winterrose (all from Caltech), along with HPCAT beamline scientists Paul Chow and Yuming Xiao. The higher vibrational entropy of the ordered phase in the equiatomic alloy FeV, which has a body-centered cubic parent lattice, determined by combining measurements from inelastic neutron scattering (INS) performed at the ARCS instrument at the Spallation Neutron Source (Oak Ridge) and nuclear resonant inelastic x-ray scattering (NRIXS) performed at HPCAT. 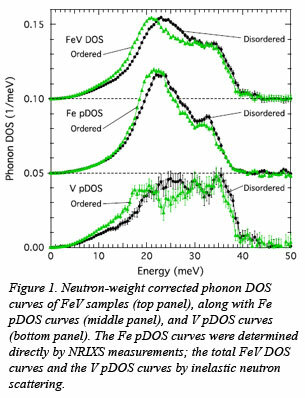 This allowed for an accurate determination of the phonon density of states (DOS) and the study of iron and vanadium motions separately through their partial DOS (pDOS) curves, as shown in Fig. 1. It was observed that all the vibrations shift to lower energies and have higher entropy upon ordering, but the effect is more prominent for low-energy transverse vibrations than for longitudinal vibrations. The effect is also stronger for vanadium atoms than for iron atoms. The origin of this phenomenon was shown by computational work to be at the level of electrons. The ordered alloy has more electrons available to screen the displacements of moving atoms, especially the vanadium atoms. This new correlation between the change in the electronic structure of a particular atom in a system and the shift in energy of the pDOS of that atom may be more general and can be used to study other systems. A fundamental understanding of the vibrational entropy and the interaction of phonons and electrons at moderate temperatures could lead to more accurate predictions of stable phases in all systems. This work has shown that changes in the electronic structure of a system, even when the coordination number and the bond length remain unchanged, can have important and unexpected effects on the phonon DOS and the overall thermodynamics. These findings are published in Physical Review Letters [Munoz et al., Phys Rev. Lett. 107, 115501 (2011)].